When my parents, Vivian Woolley, Ruby Alexander and some others were researching the Plott family history in the 1970s, the name Enoch for George's brother never came up. Who was "brother Enoch"? Next, what is the “Enoch” connection? Tonight, as my light bulb moment occurred with Elias and Margaret Kelly-Plott’s son, Phillip A., I wondered who Margaret Kelly-Plott’s father was. I wanted to double check her father’s name. Was Margaret Kelly-Plott’s father name Phillip? If her father’s name was Phillip, then the Phillipina masculine to Phillip A. theory would be less likely. Margaret Kelly-Plott’s tombstone in Troutman Cemetery and records that she was born in 1795. In the Lincoln County Court of Pleas and Quarter Sessions reference book for 1789-April 1796, there was ONLY ONE MALE with the surname Kelly listed, “Enoch S. Kelly”. The “Enoch” name comes from Margaret Kelly-Plott’s family. I still need to verify the relationship of “Enoch S. Kelly” to Margaret; however, the puzzle piece is fitting in. The name “Enoch” is true to our Plott family history; however, most likely as a member of Margaret Kelly-Plott’s family. Father, brother ? ?Back in the 1970's when my parents started their Plott family research, they visited many Plott folks and received many Plott letters. The discussions had varying elements of how, when and who came from Germany in the mid-1700's. The name Enoch for George's brother, who died at sea never came up. The element of George having a brother, who died at sea was mentioned; however, not the name Enoch. I have looked through my parent's notes. The name Enoch was not recorded or provided in any letters received. I, personally, believe that George had a brother, who died at sea. I need German birth records to know and prove his name. I am highly doubtful that George's brother's, who died at sea, was named Enoch. The Enoch name came from the Kelly family. Enoch Spinks Kelly was more than likely Margaret Kelly-Plott's father. The "Enoch" name came from the Kelly family. Index for Kelly in the "Court of Pleas & Quarter Sessions - Lincoln County, North Carolina 1789-April 1796" book, by Kathy Gunter Sullivan. 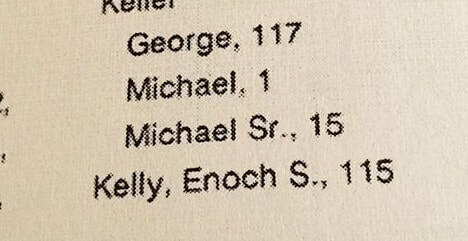 Only one Kelly was indexed, "Kelly, Enoch S. (Spinks), 115"
For the above document, there are three different Margarets that related to the document. (1.) Margaret Plott the wife of George Plott. Sister to Enoch P. Kelly. (2.) Margaret Kelly-Plott second wife of Elias Plott. (3.) Margaret Plott the daughter of Elias Plott and Charity Conrad. In the 1830 Estate Settlement file for (1.) 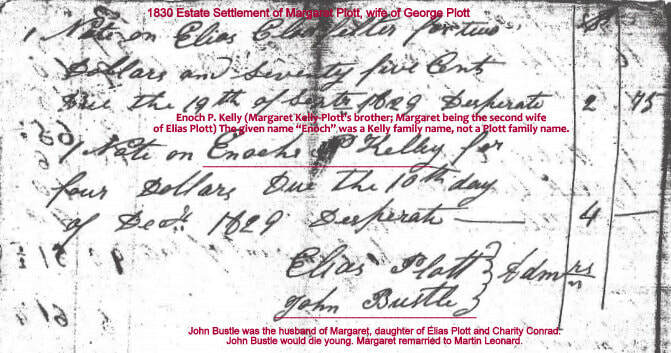 Margaret Plott, wife of George Plott, there is an account balancing sheet of funds settled. One section of the balance sheet is a listing of funds that Margaret loaned out to Elias Clodfelter and Enoch P. Kelly. At this time, I do not know the connection of Elias Clodfelter to the Margaret Plott or the Plott family. Enoch P. Kelly was supposedly the brother of (2.) Margaret Kelly-Plott, the second wife of Elias Plott. Margaret's father was to have been Enoch Spinks Kelly. I repeat that the given name "Enoch" was a Kelly family name, not a Plott family name. Also, John Bustle was the first husband of (3.) Margaret, daughter of Elias Plott and Charity Conrad-Plott. John Bustle died young. Margaret would remarry to Martin Leonard.